In addition to his four years of competition for the Club Northwest Youth Track and Field team, Nick was a four-time participant at the 1A State Track and Field Championships for the Seattle Academy of Arts and Sciences. In addition to placing Top 8 in the 400m several times, Nick also holds school records in the 300m Hurdles as well as the Boys 800m Relay. 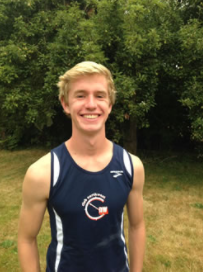 Nick was one of the first seven members of the inaugural Club Northwest Youth Track and Field team, winning several USATF Association and Region 13 Championships while qualifying for the USATF Junior Olympics National Championships on several occasions. Nick holds CNW Youth Track records in the 15-16 Boys 200m, 400m, 400m Relay and 1600m Relay; as well as the 17-18 Men’s Long Jump and 1600m Relay. After graduating from SAAS in 2014, Nick decided to attend Occidental College in Los Angeles, CA; where he continued to compete for the Tigers on the Men’s Track and Field team. In addition to his four years of competition for the Club Northwest Youth Track and Field team, Jacob was a competitor at the 3A State Track and Field Championships for Ingraham High School. In addition to his school records in the 100m, 200m, 400m and 1600m Relay, Jacob was the 2014 3A State Champion in the 400m, also placing 4th in the 200m. Jacob was one of the first seven members of the inaugural Club Northwest Youth Track and Field team, winning several USATF Association and Region 13 Championships en route to qualifying for the USATF Junior Olympics National Championships on numerous occasions. Jacob holds CNW Youth Track records in the 15-16 Boys 400m Relay and 1600m Relay, as well as the 17-18 Men’s 200m and 1600m Relay. After graduating from Ingraham HS in 2014, Jacob chose to attend Davidson College in Davidson, NC, where he has continued to compete for the Wildcats. During Jacob’s freshman campaign at Davidson, he set a new school record in the Men’s Indoor 200m dash. In addition to her four years of competition for the Club Northwest Youth Track and Field team, Carolyn was a three-time participant at the 4A State Track and Field Championships for Ballard High School. To accompany running anchor leg on the 2013 State Championship 1600m Relay team for Ballard, she also holds school records in the 400m, 400m Relay, 800m Relay and 1600m Relay. Carolyn was one of the first seven members of the inaugural Club Northwest Youth Track and Field team, winning several USATF Association and Region 13 Championships while qualifying for the USATF Junior Olympics National Championships several times. Carolyn holds CNW Youth Track records in the 15-16 Girls 100m, 200m and 400m; as well as the 17-18 Women’s 200m, 400m, 400m Relay and 1600m Relay. After graduating from Ballard HS in 2014, Carolyn made the decision to attend the University of Washington in Seattle, WA; where she has continued to compete for the Huskies on the Women’s Track and Field team.